Do you have functionality for an approval process through a time off request form? Currently the company I work for is looking for a service in which employees can request time off, and that request will be submitted to their direct supervisor. From there the supervisor can either approve or reject (either option sending an email to the original recipient to let them know of the status), and if it is approved, it gets directed to the Director. Then, once again, the Director can approve/reject and that ultimate decision also informs/emails the original recipient. I hope this makes sense. Live Tecs has a demo of this, though they're rates are a bit pricey. Looking at the details of your requirement, I can say that this is doable in JotForm. Using these features, you can make the form route to specific email accounts and do some editing/updating on the form. I would like also to suggest that you create at least a Basic Free account in JotForm to fully make use of the form builder. Using guest account only, limits the option to provide assistance if ever an obstacle is encountered. I hope this helps. Please feel free to contact us anytime should you need further assistance working on the form. I will try to create a working sample form. Will try to update you when I have it too. Although your message response does not seem to reflect on the thread, I've seen on the email that you have requested to have a sample of the approval form base on the concept you stated. I will try to come up with such form. I will post it here when I have done it. 1. For the employee email use jonathan@mailcatch.com . The employee will also recieved email notification (using the Autoresponder). In the test, you can use jonathan email account using the email provided in Step 1. How the approval process work?... its like this..
1. When the form is submitted, the supervisor will recieve the notification email. In the email, there is an EDIT LINK in the message. 2. When the edit link is used, the supervisor can now update/edit the form (put comment on the form text area...) and re-submit. 3. The Employee also have a similar EDIT LINK in the autoresponder email. The employee can re-use the edit link to review later if the supervisor have updated or reviewed the complaint. 1. As employee fill up the form and submit. 5. 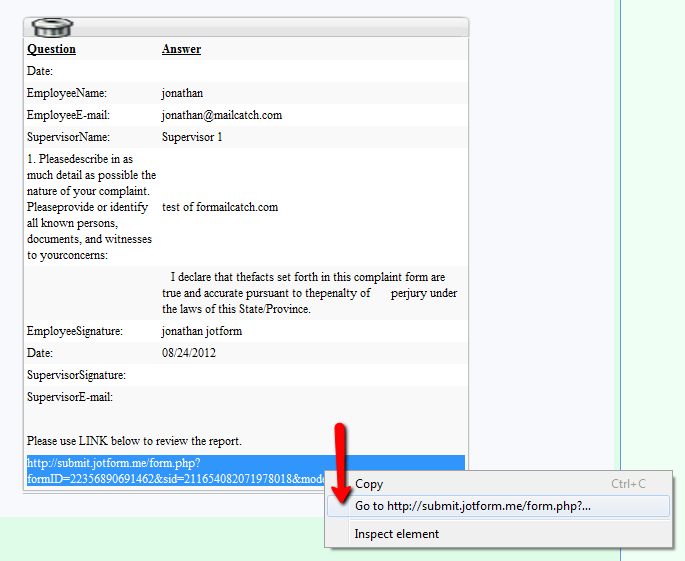 As employee re-check again the autoresponder email and open again the form using the edit_link. 6. The edited/updated form should now reflect on both the employee and supervisor view. Feel free to contact us again anytime should you have further inquiry. Thank you for updating us. Feel free to inform us if you need further assistance. When emails are submitted to the specific supervisor, I'm not seeing the "Edit_link". Where does one go in order to get that link in the email? I see the "edit_link" when logged onto jotform, but not when i open the email in my email browser. Do we have to always log into jotform in order to edit the form and resubmit to employees? Hi, since mailcatch.com allows only plain text (it is because its just a free service), you could not see the actual "clickable" edit link. BUT there is an Edit_Link to the supervisor notification messages located at the lower portion. You can simply right-click then copy/paste the link to your browser to open the form in edit mode. There is no need for the supervisor or the employee to be logged in to Jotfrom to access this forms. As my colleague also stated, it can be clickable. You can try changing the email of supervisor to that of gmail or other known email client, and you will notice that the edit_link automatically become clickable when the message is viewed. I hope I was able to explain it better. Please don't hesitate to inform us should you require further assistance.